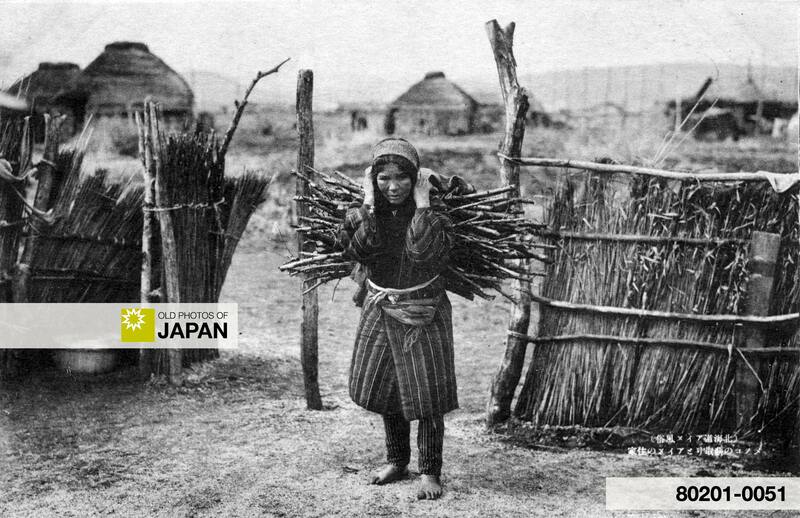 A postcard showing an Ainu woman carrying wood. Although most postcards of Ainu look more like souvenir cards from Disneyland, this photo still features some reality. The spread out toes of the woman shows that she is used to walking barefoot. Most probably she doesn’t even own shoes. Her clothes are simple and well-worn, and the houses in the background are representative of Ainu housing at the start of the 20th century. For other cards of Ainu culture, click on Ainu under Themes in the right column. You can also licence this image online: 80201-0051 @ MeijiShowa.com.